The past 5 weeks comprise 5 of the 10 lowest weeks for the average Hourly Ontario Energy Price (HOEP) rates since the IESO data starts 10 years ago. I've noted the decline while updating my weekly shadow reports, and this post will put the trends within the context of broader markets, and longer trends (including those Parker Gallant and I wrote about, in the Financial Post, last July). The price of electricity on wholesale markets is very low. While negative prices catch attention, there is only a very slight difference, in the cost to Ontario ratepayers, of -$1 and +$1. The last time I worked out an estimate, the average price paid to Ontario's suppliers, due to contracts and regulated rates, was $68.23/MWh. With the HOEP averaging around $13.50 over the past 35 days, that means a big revenue shortfall. 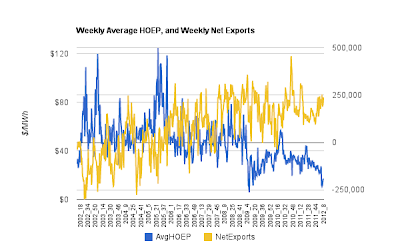 The wholesale market price, or HOEP, in Ontario is artificially low because of the over-commitments to supply, but in most North American markets the price will be very low as natural gas fired generation generally sets the market price, and natural gas prices are at 10 year lows. Adjacent markets have been paying rates slightly above the HOEP rates, but not by much. The market structure in Ontario can be seen as containing a pot that pays all the suppliers once a month; revenue from the HOEP sales fills the pot, and if it isn't full enough to pay the commitments, then the difference is gathered from Ontario ratepayers via the Global Adjustment mechanism (GA). March's estimated $62.23/MWh was nearly 25% above the previous high of $50.62/MWh, and the estimate for April, $74.68, adds 20% to March's high. Unfortunately exports aren't driving the global adjustment up even higher ... which is to say that the global adjustment increasingly includes charges for periods where suppliers are paid to cut production, as there is no market for the power at any price. 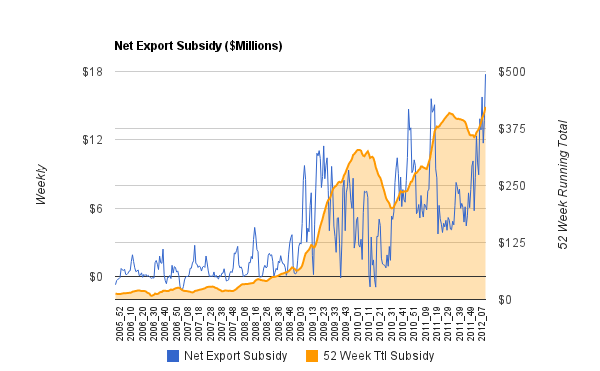 We had shown, using the forecasts from a couple of sources, that as contracted nuclear, wind and solar came online Ontario's net exports would soar to over 20TWh in the coming years. The gas supply glut, accompanied by widespread moribund, and in Ontario's case declining, demand, now make that unlikely to be possible. The average hourly net export required for 20TWh is nearly 2300MWh; thus far in 2012 we've managed only a little over 1200MW on average (at a price of just over 2 cents/kWh). The Global adjustment was 25% above the previous record in March, and another 20% higher in April. The escalation is largely because exports have hit a ceiling and our oversupply problems are increasingly more expensive. It would be interesting to see the part that wind plays in driving the GA because as it stands now, our surpluses seem to be in large due to the reduce demand in Ontario, or am I wrong?? Wouldn't the wind industry just have to say, hold back on the nuclear or even gas if net exports are going to be so high?? I think being able to show how much wind we are really using vs how much it is being exported or how much wind is forcing exports from other sources would be good info. to show the redundancy of wind. I hope I have my thinking clear on this. Thanks for your excellent info. I've tried in many ways to quantify the cost of adding wind to our grid, but the main thing driving exports is, I think, very simple. Buy high and sell low. Low prices are not allowed to act as a signal to consume more and produce less. High prices are not allowed, let alone to act as a signal to consume less and produce more. across the web. Disgrace on the search engines for now not positioning this publish upper! my day. You cann't consider simply how much time I had spent for this information! Thanks! ωebsites I might go to?? you’re off to an excellent begin!